Dual purpose post here. 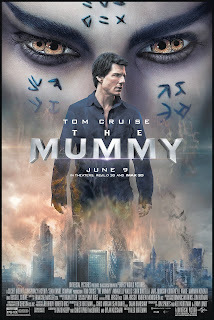 First off, we have a giveaway for some items related to the upcoming release of the movie THE MUMMY, starring Tom Cruise. In addition, we have tickets available to the advanced screening of the movie on June 6th in both Boston and Hartford. The movie itself will be released to the general public on June 9th. The MUMMY giveaway is for a prize pack including a water bottle, t-shirts, pens, and a flashlight. Giveaway is open to US residents who are 18+ and ends at 11:59pm EDT on 6/6/17. See Giveaway Rules for more complete rules.Two winners. I have to see this movie as I cannot imagine him in that role. Would love to win this prize pack. Already have passes to the ny premiere on 6/6 and for 6/7 courtesy of Amex.